This document provides guidance and suggests resources to a person thinking of starting a vineyard, so that they may develop a preliminary plan. Good planning is crucial in starting a successful viticulture operation. Assessing your own level of knowledge and taking steps to educate yourself in areas where you are lacking is a critical activity. If you are experienced in commercial fruit production, you may understand many of the relevant issues, but still need to learn how to manage grapes as a crop, as well as market the fruit. If you have little or no experience in production agriculture you may also need to learn about regulatory issues, labor issues, marketing, and crop management. Your Rutgers Cooperative Extension professional in the county where your vineyard is to be established may be able to direct you to many resources to assist in the planning of your vineyard, njaes.rutgers.edu/county/. The New Jersey Department of Agriculture (NJDA), State Agriculture Development Committee (SADC) provides a website, Resources for New and Aspiring Farmers, which has links to information to help those who are new to farming get off to a successful start. Why do you want to grow grapes? Before you decide to grow grapes, you have to consider why you are planting them. Will you grow for your own personal use? Do you plan to start a vineyard to sell grapes to wineries? Do you want to grow grapes for your own winery? These questions need to be answered before coming up with a business plan for your endeavor. What are your Farm and Family Goals? Planting a vineyard is a long-term commitment and setting reasonable goals for yourself and your family is necessary to be a successful grower. Having set goals for yourself helps you, as a grower, to better plan for the future of your vineyard. This is one of the most important questions to consider before deciding to start a vineyard. 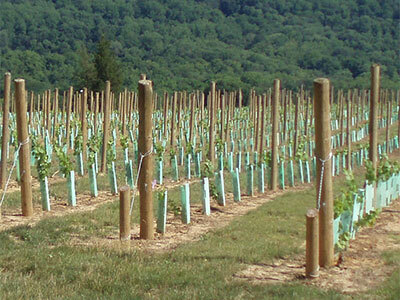 Many factors determine whether planting a vineyard is a good or bad idea for you. For what purpose will you use your grapes? Is there a market for your product? Is the site or sites you are considering acceptable to grow grapes? Is your plan to eventually operate your own winery at your vineyard site to use your grape production? Considering these answers, is planting in your region profitable and economically feasible? Creating a business plan is the first step in starting a successful vineyard. The link below are helpful guides for preparing your own vineyard business plan. Vineyard Business Plan Workbook (PDF) – This Illinois-based business plan workbook can be used as an outline for the business plan of any vineyard. It contains references to useful books, publications and information on vineyard supplies. How much does it cost to start a vineyard? Before deciding to plant a vineyard, you must think about how much the start up and operating costs will be. The sources below are useful tools in estimating specific vineyard costs; however, establishment generally costs in the range of $10,000–$15,000/acre. Wine Grape Production Guide for Eastern North America (NRAES-145) – This production guide is the best single reference for grape growers in the East. Authors from throughout the region contributed to this edited volume. The first chapter, "Costs and Economic Returns of Vineyard Establishment and Operation" should be read carefully and early in their learning by anyone considering starting a vineyard or winery in New Jersey. Wine Grape Production Guide for Eastern North America is being sold by Cornell PALS Publishing (formerly NRAES); also, Virginia Vineyards Association, Amazon, and others. How much time and money will it take to break even and make a profit? Starting a vineyard is a time and money-consuming endeavor. It may take years before it starts yielding a profit so considering how much money you can afford to invest in those beginning years is important in determining if planting a vineyard is right for you. In addition to the years required for the vines to become profitable, the hours of labor required to achieve this end must be considered. Growing grapes is labor intensive! How the labor requirement for vineyard establishment, maintenance, and management will be met is a huge component of vineyard plan. How will you market and utilize the grapes? Identifying markets for your product is one of the most important factors for new growers. Before you grow the grapes, you need to know if you will be able to sell them. Is there a market for your fresh grapes? Is it profitable to sell your grapes in that market? Should you process the grapes and make juice or wine to market? Will customers come to your vineyard to pick grapes? If you are able to make wine, will it sell? Will you need to operate an ancillary agritourism business to help market your fresh grapes or processed product? What are the regulatory issues that will be important? There are many regulatory issues to consider when starting a new vineyard. The link, Resources for New and Aspiring Farmers, provided in the first section contains very useful information regarding regulatory issues as well as lists of agricultural contacts that can provide assistance and answers to grower's questions. Regulatory issues are also covered in many factsheets and bulletins on the Rutgers NJAES website. Pesticide Control Program website - Provides information regarding pesticide regulations and obtaining the proper licensing. A vineyard may not be established in wetlands and must be approved in other protected areas (e.g. the Pinelands). Your District Conservationist with the United States Department of Agriculture (USDA) Natural Resource Conservation Service (NRCS) Conservation District, and your local Rutgers Cooperative Extension professional may be helpful in assisting you with soil surveys, water, soil, irrigation, wetland delineations, and Pineland and Highland issues. Site selection is crucial to grape growing success. There are climatic, soil, land use, and proximity factors to consider in evaluating a potential grape growing site. New Jersey Center for Wine Grape Research and Education – This website has links to facts regarding New Jersey winegrape production and interactive grape site suitability maps for the state of New Jersey. The Basics of Vineyard Site Evaluation and Selection - This Cornell and Cayuga Community College website presents a "concise overview of vineyard site selection." Web Soil Survey - This national web soil survey allows access to interactive maps that provide information about the soil for a selected area of interest. Most productive vineyards in New Jersey benefit from supplemental moisture via irrigation during establishment years and periods of drought stress. Depending upon the acreage and water use, irrigating grapes may require approval and certification from the state of New Jersey. Based on the vineyard site that has been selected, the grower needs to decide which varieties are most suitable for that site based on varietal and rootstock strengths, weaknesses and marketability. The following sources provide information on some of the varieties best suited for the Mid-Atlantic region. 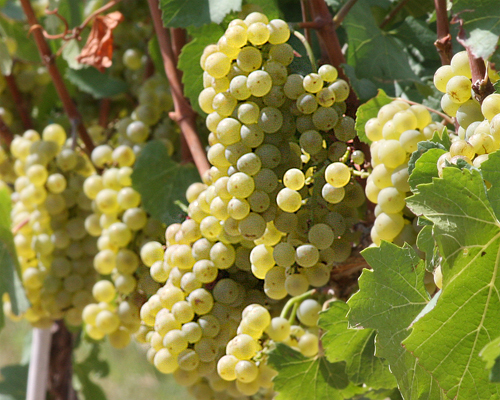 Commercial Grape Varieties of Virginia (PDF) - This publication provides a thorough description of many of the commercial grape varieties suitable for Virginia and other Mid-Atlantic states. 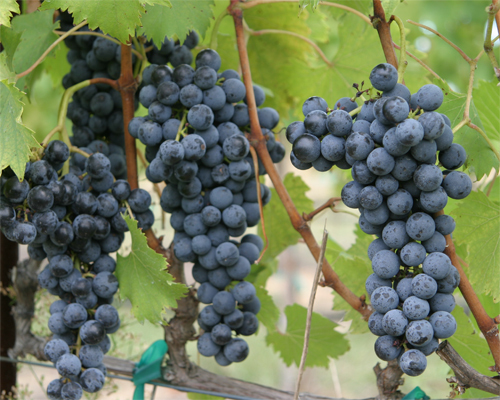 Wine and Juice Grape Varieties for Cool Climates - This Cornell website describes in detail the many American, hybrid, and European grapes varieties that are suitable for cool climate growing regions. The market will also determine what varieties you plant. Visit grape marketing operations and wineries to see what they are growing and selling. The Garden State Wine Growers Association has many award-winning New Jersey wineries as members. Talking to local growers and those marketing may give you valuable insight on market trends. 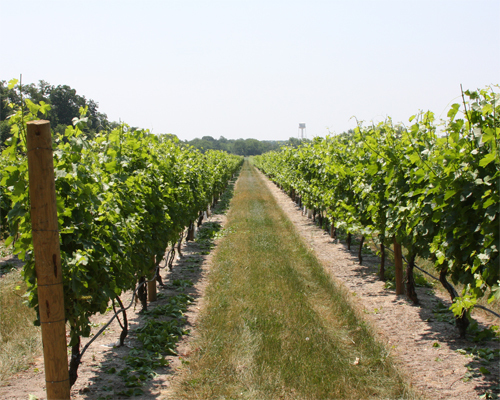 The Outer Coastal Plain Vineyard Association lists the vineyards in the Association all in New Jersey and provides statistics on varieties and acreage. Trellis selection and canopy management (61mb PDF) - This publication is a brief overview of the different trellising styles and the factors that influence the vineyard trellis design. Organic Certification and Production Guide - Organic production is much more challenging than conventional grape production in New Jersey and has not been successful. The following web site gives potential organic growers all the information needed to certify their farm or vineyard as organic in New Jersey. How will you continue to learn? After thinking about these questions and considering your goals your next step may be to contact your local Rutgers Cooperative Extension office. They can put you on mail/e-mail lists for educational meetings, events, and newsletters that relate to grape production. 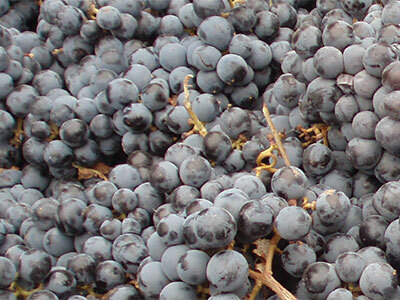 Cooperative Extension has developed a national extension web site called E-viticulture that aggregates education information on viticulture from across the United States in one easy to use location. You can also visit the Rutgers NJAES Wine Grape Resource Center website for more links and Rutgers publications (also listed above). One of the most important publications links on this site is the Plant and Pest Advisory - Fruit / Wine grape newsletter to which you can subscribe. The Garden State Wine Growers Association and the Outer Coastal Plain Vineyard Association previously mentioned are active in developing the industry and attending their meetings can be very informative. Subscribe to industry, trade, and Cooperative Extension newsletters. Wine Grape Information for Pennsylvania and the Region - This newsletter by Mark Chien, Penn State University Viticulture Extension Educator, is an excellent source of current information for grape growers in the Mid-Atlantic—highly recommended. Starting A Commercial Wine Grape Vineyard (PDF) - This fact sheet by Dr. Bruce Bordelon of Purdue University provides a summary of what it takes to start a vineyard from an Indiana viewpoint.